It was the last day of September, late in the evening, when our Latvian guests Jolanta and Tīreļu dzītuve / LV-Destilāti arrived in Estonia. They stayed at Annenhof`s Guesthouse in Lahemaa. We met on the first morning of October. We started our day from the spot where the story of Ülearu Tourism and Riding Farm began. We drove to Kõnnu village, into Paunapõllu Farm, where in 2001, with only two horses we started raising and breeding them. There were three houses with four beds in each inside and a guesthouse for ten people in use, at that time. In 2015 we stopped our activities there and moved into Ülearu Farm, six kilometers away, with 21 horses. From Paunapõllu, together with our guests, we drove to Ülearu Farm. 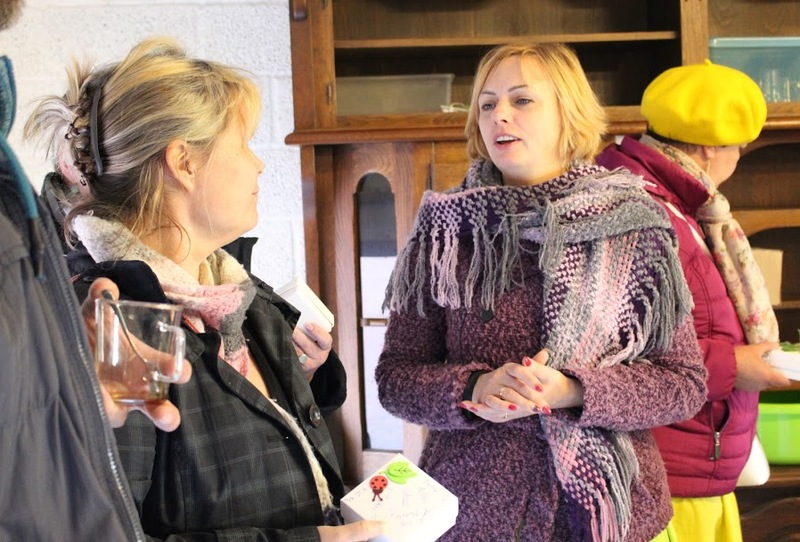 We showed our guests the farm, its functioning principles and ideas. Ülearu Farm was mentioned for the first time in 1885, when the house was built. The farm situates in Lahemaa and North-Kõrvemaa at the same time. The Farm has 34 hectares of land, which nowadays is divided into halves by Peterburi highway. Pärlioja stream also runs through the farm land. Our horses live in a herd, they have 50 hectares of land for running, which we rent from a farm nearby. We bring up Estonian, Tori and cross-breed horses. At the moment we have 20 horses. We mostly use them for horseback riding trainings and riding therapy. There are two trainers at our stable. Therapy lessons are held by the hostess of the farm. In summer we have riding camps for children, and also therapy camps. The host of the farm is also a fisherman, who makes boat trips to Mohni Island and around Pärispea Peninsula. Keeping horses in one pack was a new thing for our Latvian guests, also the fact that horses are outside all year roud and that they do not need a stable. Jolanta was very interested in the riding therapy, because they are also looking for as wide range of use as possible for their horses. Also we had agreed to meet the hostess of Kuusekännu Riding Farm Annika. We looked at Kuusekännu`s inside riding ground and discussed construction details. Kuusekännu`s riding complex and infrastructures gave our guests ideas how to make time spent in a riding farm more interesting, comfortable and succinct. We had lunch at Viitna Tavern. From there we drove to Tallinn to look at Tallinn`s Racetrack, where unfortunately very little action takes place at the moment. 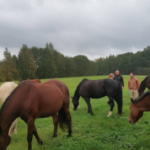 The next day we drove to Pärnu into the Horse Breeding Establishment of Tori, where reconstruction works give hope that horse breeding will be restored in it`s former glory. We visited Latvia from October 29 to October 30. Our itinerary was succinct and interesting. 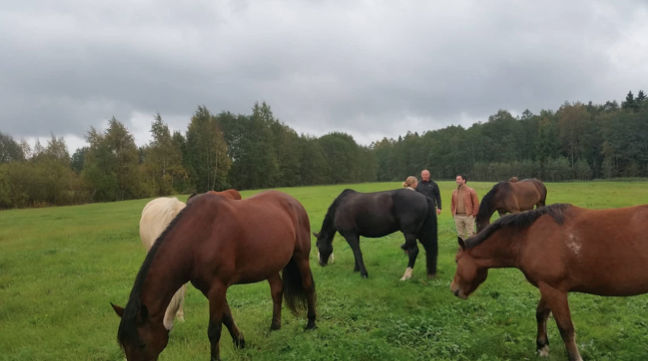 We started with 100 hectares peninsula – a nature and herbal preserve at Jelgava, which is being maintained by 80 wild horses (koinik in Estonian). Einārs Nordmanis is responsible for the horses, who is also a liaison of wild horses in Baltic and in the Netherlands and he takes care of their resettlement. We got a close review of wild horses life since their inhabitation at Jelgava. After that we had lunch and drove on towards Riga. It was a big surprise to us, how many stables are there inside the town of Riga and around it, about 18, and how different are all their business structures. We visited the stable where the hostess wants to use horses for the social integration of people. Her target group mostly would be people with addiction problems, but also clients with depression. From private stables we got a very good impression, especially from one stable with ten horses in it, which was built by a son to his mother, who is in metalwork himself. This stable is not used for sports, it is a pleasant gathering place for former riding hobbyists and old horses. But mostly the stables are ment for sports and have from 50 to 80 horses. Almost all stables have inside riding grounds. Some use innovatory solutions for taking care of the outside riding grounds, like underground humidification by raising the level of water under the riding ground into the necessary altitude. The first half of the second day we spent at our host`s place. We looked at their stable and horses. We got a close review of wine production, marketing strategies and product selection at Tirelu Destilati. From there we drove to Cesis region and visited the Camel Park at Rakši. The Park closes at the end of October every year. There are attractions for the whole day in the park. During the summer tourism period thousands of tourists visit it every day. We got very positiive feelings, experiences and ideas, which we plan to use in our own undertakings.